I am genuinely as far away from being a morning person as they come. It’s odd because I keep having babies who love to wake up with the sun, and I myself love sunrise. I suppose waking up isn’t so much the issue as doing anything the requires energy that early. So, when the kids are pining for breakfast, I’m always looking for a way to cut some corners on morning meal prep. 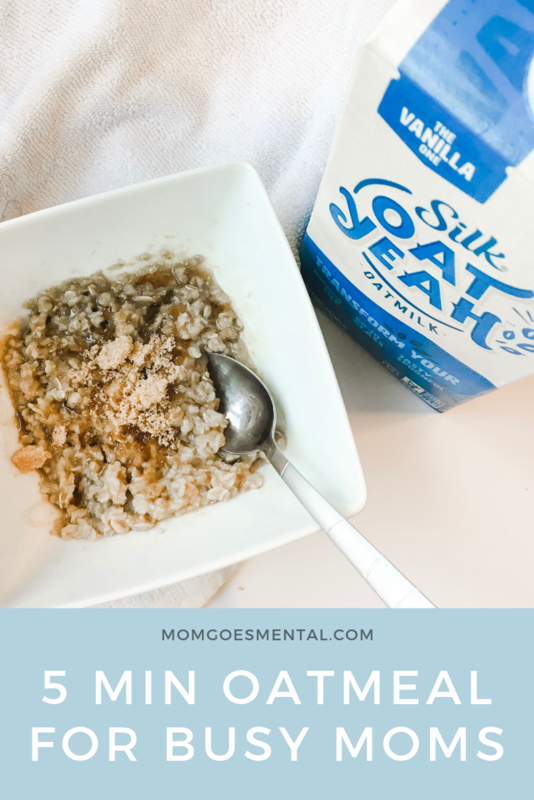 I recently had the opportunity to try Silk Oat Yeah Oatmilk, and I knew it would be the perfect addition to my easy oatmeal recipe for busy moms. I love making real oatmeal in the morning because it’s so quick to throw together. Plus, I can multi-task while it simmers all by its lonesome on the stove. 5 minutes later and the baby is happily playing in her highchair, I’ve got my cream cheese bagel, and the kids are digging into their homemade oatmeal. Did I mention I get to win Mom of the Year now, too? 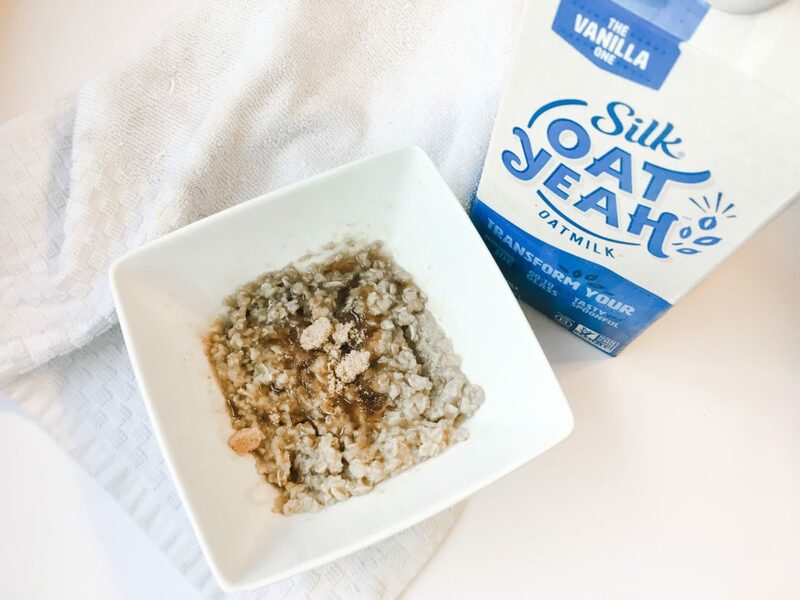 Because the kids say that the Silk Oat Yeah Oatmilk made the oatmeal taste even better. I tasted it, and I have to agree that it’s definitely better! As a mom, I also love that it’s a nut-free milk alternative since we’re not huge cow’s milk lovers. In a saucepan, bring oats, milk, butter, and salt to a bubbling strong simmer over medium heat. Reduce heat to low and simmer until oats are softened according to your taste. I like oatmeal that’s just done, so I cook mine for about 5 minutes. Allow to cool slightly before serving. Drizzle maple syrup over warm oatmeal and sprinkle brown sugar on top. The Silk Oat Yeah Oatmilk (instead of plain water) gave the oatmeal a much richer taste and definitely made it creamier. It was also slightly thicker than our normal oatmeal, meaning this momma had to clean up less mess when the baby insisted on feeding herself. This easy oatmeal recipe is also completely customizable! Leave out the maple syrup and brown sugar and try adding some of these flavorful combinations. Add cinnamon and diced apples to the oats as they cook. Try drizzling maple syrup over cooked oatmeal and sprinkle on bits of crunchy bacon. Garnish with fresh berries, sliced almonds, and chia seeds. Sprinkle your favorite granola mix and dried berries right on top. Whether you’re a not-so-morning-person like me or one of those moms who happily greets the sun, we’re all crazy busy first thing in the morning. Every little mouth needs to be fed, someone is sure to have lost a shoe, and there may or may not have been one little who forgot they had homework. But even busy moms can make this delicious oatmeal—for real. If I can make it happen being the grizzly bear in the morning that I am, you got this. Bump up the flavor with Silk Oat Yeah Oatmilk and your favorite fixin’s! Where can you find Silk Oat Yeah Oatmilk? I grabbed mine at my local Walmart and am really excited about adding it to my regular Online Grocery Pickup order. Check out your closest Walmart to grab yours in either Vanilla, Chocolate, or Plain flavor. This sounds so tasty, I wish I had some now. I’m vegan so it’s perfect plus I’m a terrible cook but I think I can handle this. The berries, almonds and chia seeds will be my first creation. Thank you!